“Whimsical live-action puppet film!... Magic: visible strings, unhidden mechanisms, undisguised vegetable props = beauty." "An Eggstravaganza for the Kids"
"...a captivating story that unfolds on screen. [The] side action enhances the overall richness of the experience... The puppeteers infuse their tiny characters with such human attributes that one becomes grippingly engaged.... absolutely uncanny... ...remarkable lucidity." 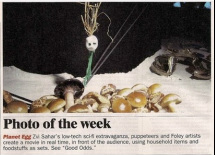 "More polished than your average tech-demo/theater-hybrid....Planet Egg is a whimsical production"